On May 20th 2016, The FDA and Michelle Obama unveiled changes to the Nutrition Facts box that is found on all food packaging sold in the United States. They are the most significant changes since the Nutrition Labeling and Education Act (NLEA) was passed in 1990, requiring all packaged food to bear the standardized nutrition label and ingredient panel. The changes reflect new Scientific data on nutrition especially as it relates to sugar consumption. The changes in a nutshell. 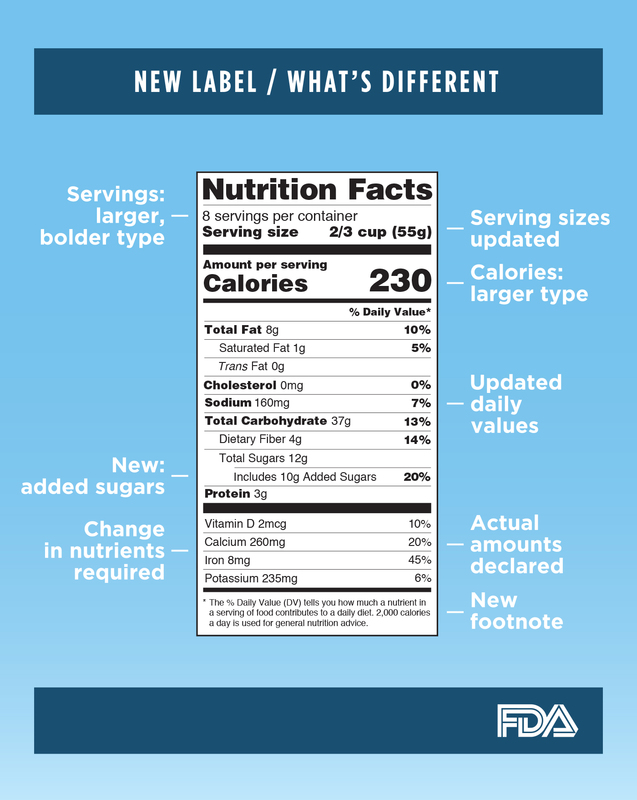 While the new label may look like the old one there are significant changes which the FDA feels will help consumers be better informed when making decisions about the nutritional value of the foods they purchase and consume. One of the most noticeable changes is the bolding and increase in the font size for Calories and Serving Size, emphasizing the information and making it stand out. The serving size is now based on what consumers actually drink or eat instead of what they should be drinking or eating. For example, in a liter of soda, a serving size used to be 8 ounces and is now 12 ounces. Since people usually consume anything that is between one and two servings (like a 20 ounce soda) as one serving, the calories and other nutrients will be labeled as one serving in that instance. Also, there is now a “dual column” label that will be used if a product is larger than one serving but may be consumed as one serving, such as a 24 ounce soda. The consumer will then easily be able to see the one serving calorie and nutritional information as well as the entire package information. There are some nutrients that are required that were not previously required such as Vitamin D and potassium, and some that have been dropped, but the main change to the content is in the new “added sugars”. This change is based on new scientific data that shows if you your daily calories are more than 10% sugars, it is hard to meet your nutrient needs and stay within your calorie limits. This number shows the amount of sugar that has been added verses the amount of sugars that naturally occur in some foods such as fruit. Most manufacturers will need to be in compliance with the new labeling by July 26, 1918 but if you have less than $10 million in annual food sales you will have an extra year to comply. If you and your team need help executing these new changes, give Arena Design a call. We will help guide you through the process. Arena Design in 2 minutes.